3 Bedroom Detached House For Sale in Sheffield for Asking Price £320,000. This property's price has dropped from £340,000 to Asking Price £320,000. 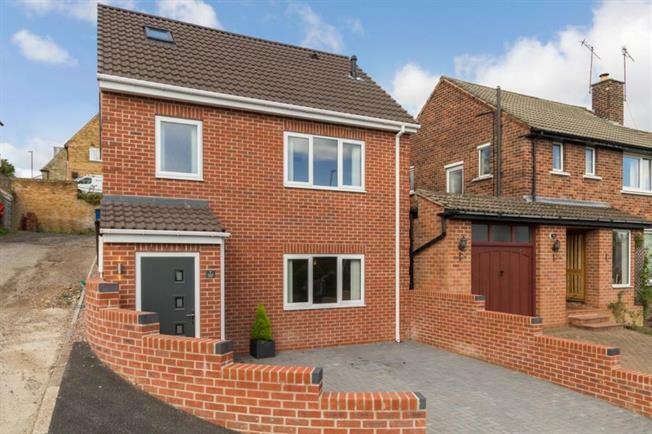 This newly built detached family home has been recently completed to show home standard, offering deceptively spacious accommodation over three floors, decorated & carpeted, along with solid oak internal doors throughout. An internal inspection is highly recommended to appreciate the 1213 sq. ft. (approx) Of accommodation on offer positioned on Knab Rise with in Carter Knowle, a popular residential location walking distance of local amenities including local shops, cafeterias and regarded schools (including the new Mercia school on Carter Knowle Road). The accommodation in brief comprises: Entrance porch leading into a spacious open plan lounge/dining room where stairs rise to the first floor landing, opening into the attractive fitted kitchen where there is a good range of white high gloss wall and base units with integrated appliances include ceramic hob, extractor fan, electric oven, automatic washing machine and fridge and freezer. First floor landing: two double bedrooms and family bathroom having a three piece suite in white with mains shower & screen over bath, ladder towel radiator, tiling to the splash backs, extractor fan and spotlighting to the ceiling. Stairs then rise to the master suite with access to an en suite bathroom having a piece three piece suite in white with mains shower & screen over bath, ladder towel radiator, tiling to the splash backs, extractor fan and spotlighting to the ceiling. Built in shelving and storage cupboard. Externally: To the front of the property is a blocked paved driveway for two vehicles, whilst to the rear of the property is a landscaped enclosed garden with block paved sitting area. Location: Occupying an extremely convenient and sought after location, within close proximity of a shopping parade, bus services, close to Banner Cross and Abbeydale Road shops and easy access to the city centre. The property also falls into the catchment area for highly regarded local schooling for all age groups, and is not far from both Chelsea Park and Millhouses Park which offer opportunities for recreational pursuits.